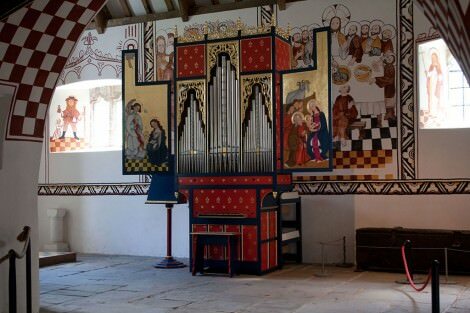 The new organ is based on the Wetheringsett organ made for the Early English Organ Project in 2001, which was based on the soundboard found in 1977 at Wetheringsett in Suffolk. Its characteristics suggest that this organ was made by an English builder, probably local. They include a long, fully chromatic key compass, choruses of wooden or metal pipes of the same scale and style, each with its own slider, and a voicing style familiar from 17th century English organs, but also Italian and Spanish organs. The organ for St Teilo is physically smaller. Its pipes are based on the only pipes surviving from the mediaeval West Country tradition, from John Loosemore’s 1665 organ for Nettlecombe Court. They are very narrow-scaled and without nicking, so the speech is sibilant and the tone rich. The case is a much-reduced version of the case at Old Radnor, copying the carvings. The painted and gilded decoration was provided by Fleur Kelly and Lois Raine, who worked on the painted woodwork at St Teilo’s. http://www.fleurkelly.com/ painted the wonderful Annunciation and Adoration of the Shepherds on the doors. Key compass: The key compass is C to a², 46 notes, which is the number of grooves in the Wetheringsett soundboard and the compass specified in the contract for Holy Trinity Coventry (1526). It matches the ranges needed for the surviving repertory. This key compass allows for transposition by the player, extended by the sub-octave Diapason for choral and vocal accompaniment in the early 17th century verse style. There is a second keyboard which can be folded down to give ‘singing pitch’ at F – d³, for demonstration purposes. Pitch: The nominal pitch is 5ft, i.e. a plainsong pitch a fourth above singing pitch, the basis for all the Tudor organs we know about. The actual pitch is a semitone above A440 at singing pitch. Tuning: The tuning system was recommended by Arnolt Schlick in his Spiegel der Orgelmacher published in Heidelberg in 1511, and intended as a guide for good practice throughout the Holy Roman Empire. He was the first writer to give a recipe which mentions every note of the scale. It is a modified form of mean tone tuning, with good (not pure) major thirds and the wolf spread to some extent over neighbouring fifths to allow some modulation (though ab is still much closer to being a g#).